Author, Leslie Buck will show photos from her New York Time’s reviewed garden memoir, Cutting Back-My Apprenticeship In The Gardens Of Kyoto about working in one of the most historic landscaping companies of Kyoto for three seasons. Japan is known as a nation of long-lived families and family businesses. There are more than 30,000 centuries-old companies that exist in Japan and many of them have been family-run for many generations. Animation that marks the directorial debut for Mari Okada, the scriptwriter of works including The Anthem of the Heart. Depicts the "eternal moment" of a boy and girl who meet amidst the passage of time. Dr. David Desser (Dean, Anaheim University Akira Kurosawa School of Film) will help you “Re-Imagine Akira Kurosawa” as he provides you unique insight into Kurosawa and his classic film, High and Low (1963), which was adapted from Ed McBain’s detective novel King’s Ransom. Panel discussion/Q&A session follows the lecture. In this lecture, by sampling video clips from various Korean and Japanese programs, we will explore some unique aspects of the two cultures, especially as it connects to how people communicate with one another. After the lecture, you will enjoy a tasting of Korean and Japanese food and beverages and be able to “grab” an understanding of the two cultures! No language knowledge is required. 24-year-old office employee Yoshika (Mayu Matsuoka) has a secret crush on her former junior high school classmate Ichi (Takumi Kitamura), but then her colleague Ni (Daichi Watanabe) asks her to be his girlfriend. The Japan Foundation, Los Angeles will once again team up with TABLE FOR TWO USA for an Onigiri (Rice Ball) making workshop where you can learn how to make traditional Japanese rice balls with savory fillings and seaweed! This year, thanks to the support from Sanrio Inc., you will have a chance to make one-of-a-kind Hello Kitty onigiri! All workshop participants will also receive a small Halloween-themed gift from Sanrio! Space is limited and RSVP is essential. Legendary guitarist Marty Friedman reveals a Japan you’ve never heard of. Why did an American musician, known for his tenure as the lead guitarist for the heavy metal band Megadeth, decide to move to Japan in 2003 and has never gotten bored since? Please send in your questions to Marty! The Japan Foundation is honored to present the Carving Across Borders: Block Prints of Hiroshi Yoshida exhibition with the generous support of Randall and Diana Fullmer. Dr. Kendall Brown professor of Asian Art at California State University, Long Beach traces how oil painter Yoshida Hiroshi (1876-1950) revived his career and helped launch the "new print" movement by utilizing his skills as an artist, maven and entrepreneur. Enjoy Japanese fruits confections after the movie! HIDETA KITAZAWA has worked extensively with non-Japanese performers to create evocative contemporary masks. His interaction with playwrights, actors and directors leads him to the creation of forms that fit their vision. His masks grow from a deep knowledge and thorough mastery of the centuries-old techniques of traditional mask-making. A single block of hinoki -- a Japanese cypress -- is chosen, and after preparing a clay model, chisel is laid to grain. Meticulously painted watercolors are applied to gesso-coated wood, and the actor brings the mask to life on stage. TARFEST is a premiere arts and culture event in Los Angeles and the Miracle Mile District. At the Japan Foundation, Los Angeles tent, you can enjoy Japanese cultural activities including uchiwa (Japanese fan) making, kite making, and Amezaiku (candy sculpting) performance . Free Admission *Standard parking rates apply. Join us for a viewing of the new Initial D trilogy, co-presented by The Japan Foundation, Los Angeles and the Petersen Automotive Museum. All three films will be screened over the course of the evening. Light refreshments and Japanese animation goodies bag (limited supply) will be provided. Enjoy outdoor movie screening in Japanese Friendship Garden located in Brand Park, Glendale. Bring a blanket or chair for sitting on the lawn to watch the movie. Friday, September 7 @8pm "Your Name." Friday, September 14 @8pm "Shin Gozilla"
Friday, September 21 @8pm "Mameshiba"
Friday, September 28 @8pm "A Tale of Samurai Cooking - A True Love Story"
Outdoor Movie Night at The Source presents Japanese Cinema Month! Every Friday in September, we will be showcasing popular Japanese films, from anime to cultural films. Movies will start at 7PM and will screened at the 1st floor Step Plaza at The Source. Manga is a great tool to learn Japanese as well as Japanese culture! To promote this concept of “Manga Edutainment (Education Entertainment)”, we introduce a variety of manga books to you (See the link). In order to give you a chance to browse these manga, we are exhibiting the first volumes (first volume= ikkan in Japanese) of about 200 titles written in Japanese. We will open the manga lounge on Saturday August 4 from 2 to 4pm (after the Tea Time event), so please come, flip through the first episodes and explore the world of manga! Torrance Cultural Arts Foundation & The Japan Foundation, Los Angeles present producer Genki Kawamura’s follow-up to his mega-hit Your Name. with another tale of star-crossed teenage lovers and a sci-fi fantasy twist. For 1,300 years Japan has been the world leader in paper making. Join JFLA and Hiromi Paper, Inc. as we delve into the World of Washi (Japanese paper) and its history through a special Virtual Washi Tour Presentation of Japan's paper making regions. A film adaptation of Michifumi Isoda's original novel which is based on a true story from the middle Edo Period. This film comically depicts the efforts of Yoshiokajuku, an inn town in Sendai fief, to save themselves from impoverishment by running a moneylending enterprise against the fiefdom. 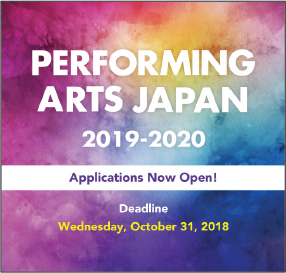 The Japan Foundation is now accepting project proposals for Performing Arts Japan (PAJ) touring and collaboratrion grants for the 2019 - 2020 fiscal year. Application deadline is 5:00 p.m. EST, October 31, 2018. Romance starring Motoki Masahiro from Departures with original story, script and direction from Nishikawa Miwa of Dreams for Sale. A bestselling author discovers the joys of living for others after his wife dies and he spends time with children who have lost their mother. Do you have plans to go to Japan in the near future? If so, we will get you prepared! You will learn helpful travel tips from a tourism specialist from JNTO(Japan National Tourism Organization), and essential Japanese phrases from our Japanese language course instructor. We will demonstrate Japanese social etiquette, too, so you won't be just a "stranger" in Japan. This workshop is suitable for beginners and those with no experience at all. Along with tuna and salmon, squid is one of the most popular, and its presence in Japanese culture cannot be overstated. With its high-protein and rich amino acids, squid has many benefits. Squid also has the potential to be developed as a marine resource and could be ideal in improving the global food shortage which faces us today. In this lecture, squid lover and biologist Dr. Tomano, who has researched squid both in Japan and US, will talk about the long-term relationship between Japanese and squid, its amazing life, and the benefits of squid as food. In the following reception, there will be a sample of Japanese delicacies using squids offered to attendees. Haru, a high school girl comes to Kichijoji looking for Sachiko, the woman mentioned in a love letter of Haru’s late father. Currently living at Sachiko's address is Jun, a female university student who loves playing guitar. Jun becomes interested in Haru's cause, and together they start to search for Sachiko's family house where they meet Sachiko's grandson, Tokio. He tells them that Sachiko passed away just recently. Due to the popularity, we will be extending the exhibition until July 21! Japanese gyotaku (lit. ‘fish rubbing’) is the unlikely marriage of fish, sumi ink, and washi paper. Once used to record the size of an impressive catch, it has been elevated to a fine art through the efforts of gyotaku masters. "Impressions of the Seas: Gyotaku Fish Prints" by Dwight Hwang features a selection of prints depicting freshwater, coastal and open ocean specimens alongside objects which detail the gyotaku printmaking process. A science-fiction drama by internationally popular director, Sion Sono, who brings to life a script he wrote in 1990. An android delivering packages to a decimated human race is depicted in black & white imagery and whispered dialogue. TA・TA・KE・TA・KE: Let's Play Bamboo Beat! If you have played music before, you might already be familiar with time signatures such as 2/4, 3/4, and 4/4. But have you ever heard of time signatures like 1.618 and 1.732? There is an infinite number of rhythms, including fractional, or non-integer, time signatures which, are neither random nor do they repeat. There are even fractional rhythms which go on and on and take an astronomical amount of years to complete. Creepy is film adaptation of mystery novel detailing the intertwining double enigmas of an unsolved missing family case and an odd, neighboring family. Directed by world-renowned director Kurosawa Kiyoshi, of the horror film Pulse. In this lecture, Dr Ellis Tinios tells a tale of deceit and low cunning, blatant plagiarism, willful misrepresentation and great art. He tells the story of ‘Hokusai’—the hottest brand in 19th-century Japanese publishing. Study Japanese this spring! The registration period for our JF Nihongo Spring term has started! People interested in learning Japanese at JFLA will have three beginner-level Japanese-language courses. In each class, students will learn concepts and communication skills which are essential to having a well-rounded understanding of everyday Japanese! Register by April 13 and get a 10% early bird discount! In his twentieth film, acclaimed international film director Kiyoshi Kurosawa (Pulse and Tokyo Sonata) reinvents the alien movie as a unique and profoundly human tale of love and mystery. April is Cherry Blossom Time in Japan. The word “Matsuri” means joyful festival. Please join us, in conjunction with Friends of Shoseian, to enjoy a full day of many exciting activities, including: Taiko drums, martial arts, tea ceremony, calligraphy, music, dance and fun learning the Japanese language! Curator, Yumi McDonald is in person. In this lecture, a president of Akita Inu Hozonkai, Los Angeles Branch, Steven Takamatsu explains basic history of Akita dog in U.S., his characteristics and charms, and difference between Japanese Akita and the American Akita as two separate breeds. A TV director Kanami Hisano (Satomi Kobayashi) is devastated by the passing of her beloved dog Natsu to illness. Then, at the suggestion of an esteemed senior movie director, she starts filming a movie with dogs as the theme, going to adoption centers and shelters caring for dogs within the 20km “red zone” of the Fukushima nucler accident. Helen Keller loved the famous loyal Akita dog Hachiko. When she visited Japan in 1937 she was given an Akita puppy from people in Akita. The exhibition introduces much less-known relations between Helen Keller, Hachiko and her Akita dogs. The exhibition is a rare opportunity to look at the pictures collected from Tokyo, Akita, New York, Boston and Westport, Connecticut where Helen Keller used to live. Wellness Wednesdays: We offer Wellness programs every 1st and 3rd Wednesday at lunchtime! February 28 is Yoga day! In this program, no need to change clothes or use a yoga mat; you will be seated in a chair receiving relaxing instruction from a bilingual (English and Japanese) instructor. Learn simple Japanese phrases during the instruction and stretch your mind as well as your body. Japanese pop music (J-Pop) has been greatly widespread and continues to gain popularity throughout the world. Part of their popularity is due to the Japanese animation, manga and fashion cultures. However, J-Pop has various distinct characteristics and is meticulously constructed to stay in the listener's head. In this lecture, Dr. Jonathan “Capital” Patterson will explain J-Pop music theory and will expose their secrets. You will develop a deeper understanding of music between Japan and the West as well as appreciate J-Pop music. Come enjoy the world of J-Pop music. Zoomdanke will offer a free performance and a short kendama workshop. Have you ever wanted to try kendama? Check out a series of free performances and workshops by celebrated performance duo “Zoomadanke” at Japan House Los Angeles. These pioneers blend the traditional Japanese cup-and-ball pastime with dance and music to create a new style of performance. Kendama is gaining popularity around the world as a new style of entertainment. Be amazed by this dynamic duo, and then give it a shot yourself! Please check out Japan House Los Angeles Facebook page for details. Using Sumi ink, Washi paper, and the days catch, Gyotaku (gyo =fish, taku= stone rubbing) is the traditional method of printing fish in Japan. Strictly adopting the traditional technique and materials, the artwork by Dwight Hwang is so sophisticated and detailed as to seemingly give new life to the fish. This is a preview show for the exhibition to be held in summer 2018 at the Japan Foundation, Los Angeles. All of the fish featured in this preview show will be from Japan. Director Nakano made a theatrical feature debut with a family drama about a single mother Futaba (Rie Miyazawa), whose husband suddenly left a year ago leaving her with their shy daughter, Azumi (Hana Sugisaki). All Programs are FREE and NO Reservation Necessary. Come and experience easy Japanese craft-making and watch a demonstration of Japanese Noh-performance by a renowned master from Kyoto. Immerse your kids and yourself in Japanese culture for the whole day on Sunday. January 17 is Yoga day! In this program, no need to change clothes or use a yoga mat; you will be seated in a chair receiving relaxing instruction from a bilingual (English and Japanese) instructor. Learn simple Japanese phrases during the instruction and stretch your mind as well as your body. Nobuo Anzai’s paintings are heartfelt memories of countries he calls homes— Brazil, Colombia, Spain and Japan. They are unseparated in his mind and heart through his life’s passages as a migrant worker, farmer, chef and artist.